Hi Frugalistas! 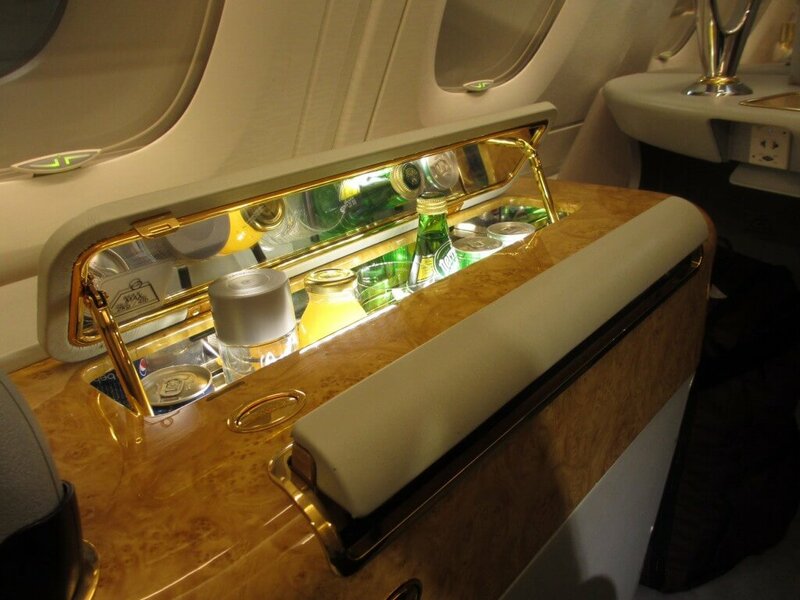 The Emirates A380 has received a lot of attention, and even has a certain glamour in some quarters. On my return to Sydney recently I was lucky enough to put its First Class cabin to the test. With suites, a shower, and all sorts of amenities, what is the Emirates A380 really like? Things don’t get off to a good start when my chauffeur car doesn’t arrive. This is booked as part of the ticket for First and Business Class passengers. Things don’t get any better when I realise that while I have a booking reference I don’t have a phone number, except the Qantas booking number (which I’d booked my ticket through), which is unattended due to the time of day in Australia. So it’s a taxi from Abu Dhabi to Dubai airport…..
Emirates has a separate check in terminal for First and Business Class travellers, which is easy to find in the cavernous Dubai departures area. There are 6 First Class checkin counters open, and I’m the sole passenger, so I’m through check in in record time. There is also a dedicated Immigration counter, which whisks me into the lift to the departure gates and lounge quickly. 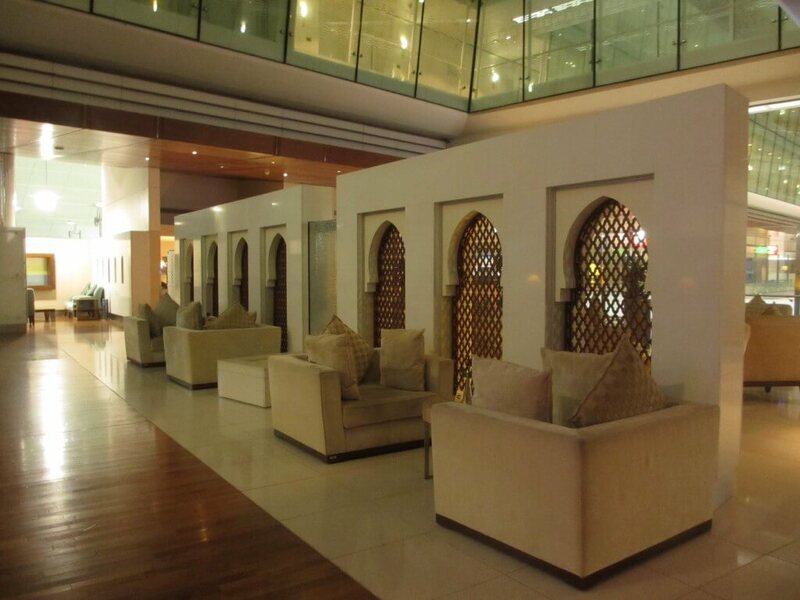 The First Class Lounge is a fair walk through the terminal. The terminal itself is very busy and quite noisy, despite it being after 11pm. 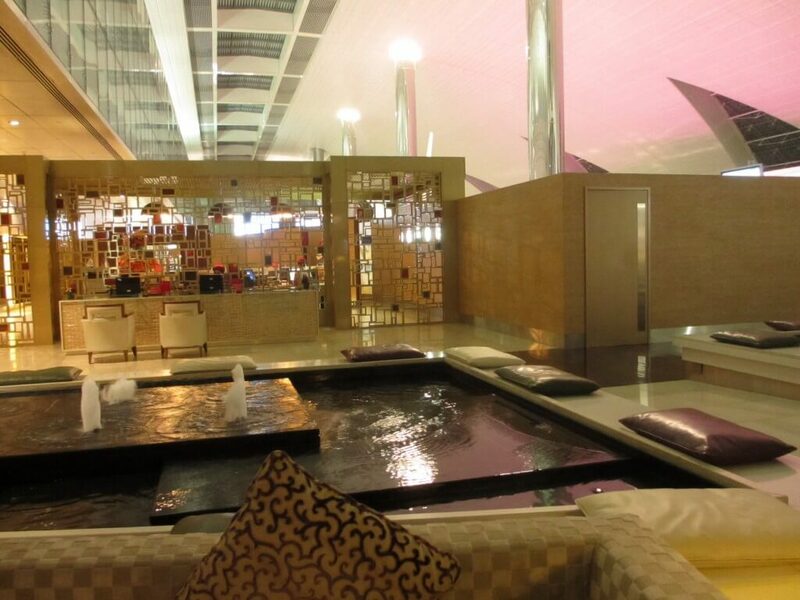 The Lounge is a world away from that – I’m greeted by a huge lounge, complete with fountains and a separate dining room. Despite the busyness of the terminal below the lounge seems quite empty. I always love the Spa in the Etihad lounges in Abu Dhabi, so a visit to the Emirates Spa is a must do for me. I’m a bit disappointed when I arrive though to discover that only 5 treatments are available for free. The remainder must be paid for in US dollars. Of the 5 there are no facial treatments, so I go for the De-stress Back Massage. It’s a good 15minute treatment and I’m pleased with the massage and service. I’ve still got an hour and half to kill, so in the interests of research I head off in search of food and something to drink. A glass of Moet and a mineral water are promptly brought to my seat, and go well with the light finger food options I’ve chosen from the buffet (more substantial offerings are available in the dining room). Top ups on both drinks are offered regularly, and the wifi works a treat. The only downside I notice is the mezzanine nature of the lounge means that a fair bit of noise wafts up from the terminal below. 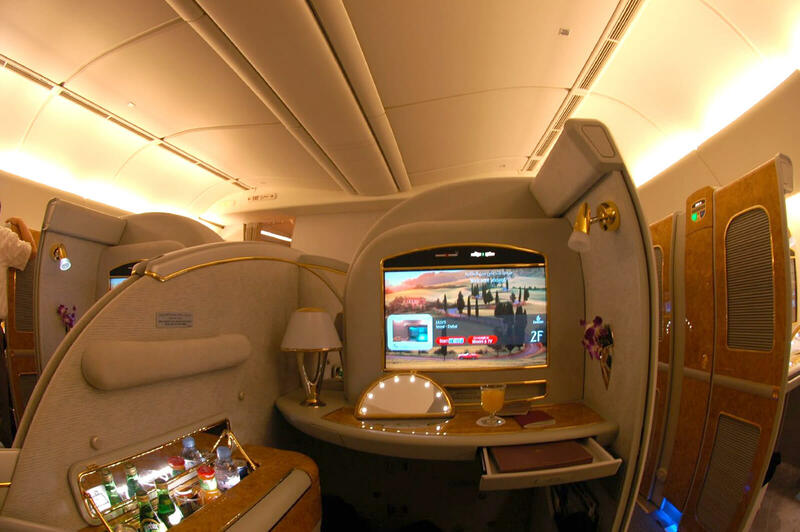 Like many premium First Class services, Emirates also offers a suite in First Class. It’s a spacious, comfy offering, with a wardrobe and storage area for my case. I’m impressed with the layout and the goodies on offer in a hotel mini bar style offering. Vintage Dom Perignon, dates and Arabic coffee make for a traditional welcome. I book my shower for landing (more on that later), and we’re off into the night sky. As it is a night time flight that arrives in Sydney just in time for bed, I opt for lighter food options during the flight. 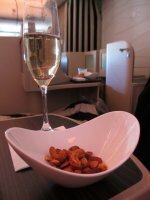 Some warmed spiced nuts are lovely with some champagne (that I need to have more of, just to make sure I really enjoyed it…..) There is an extensive menu that comes in a leather-bound folder, restaurant style. During the flight I try some brie and fig sandwiches (that are actually little dinner rolls), a charcuterie platter and a cheese platter. Everything is high quality, served elegantly and promptly. An Australian marinated Persian fetta is sublime. At the front of the cabin is a bar area with drinks and snacks, including sandwiches and Godiva chocolates for those who can’t find what they’re looking for on the printed menu. 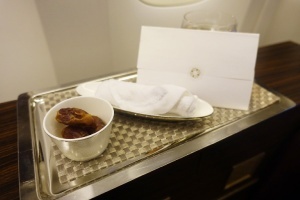 Emirates clearly has an expectation that First Class guests will take souvenirs from the flight – a hessian bag bearing the Emirates logo is provided just for this purpose. In addition to a splendid Bulgari amenities kit (with a perfume that I’m instantly in love with) there is a refresher kit of toiletries in the suite. The bathroom is also fully kitted out with toiletries and other amenities much like a hotel suite. A hotel-style minibar with chocolates, sweets, and chips also seems to available to souvenir (as we are getting ready to land in Sydney I’m asked if I want any of these sweets before they are taken away for landing). Some slippers, and a pair of the most hideous unisex brown and beige pyjamas (comfortable for inflight, but not for souveniring!) complete the “gifts” on offer. The suite comes complete with its bedding stored within it. No one offers to make up my bed, so it’s a self service job. The bed is fine and completely lie flat as would be expected. It’s not the most comfortable bed I’ve every slept on inflight, but with the suite doors closed I manage a respectable sleep that’s enough to keep me refreshed, but not long enough to stop me sleeping when I get home. Service is pleasant, prompt and attentive, but I notice that I don’t seem to have a dedicated flight attendant. This makes it appear somewhat impersonal, and does detract a little from the experience. 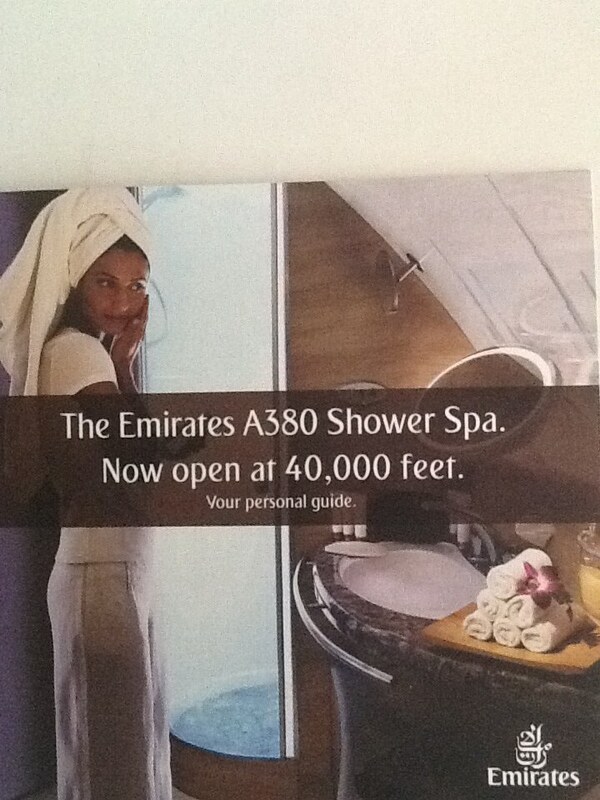 Emirates obviously love their inflight shower – it has its own brochure that is handed out to passengers on arrival. Showers need to be booked, and each passenger seems to allocated a 30min window with 10mins of actual water time. I’m escorted to the bathroom and given an orientation and safety demonstration. The bathroom is just like a hotel bathroom with soft towels, plenty of toiletries, loofas and even a hair dryer. The shower itself is surprising spacious (putting many European hotel shower cubicles to shame) and water pressure is good. It’s a wonderfully luxurious experience, but given there’s shower facilities in the First Class Lounge I do wonder how often it gets used and how necessary it really is. I like the Emirates A380 First Class offering. Emirates is very generous towards its premium passengers, however, I would like the service to be a little more personal. The limited food I tried was good, and I’d love to give the menu a more extensive work out. I would happily fly Emirates First Class again if the opportunity arises. 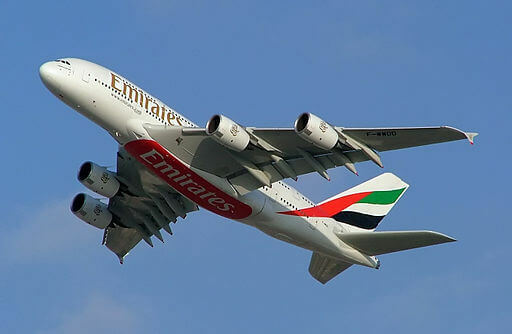 Regardless of your class of travel you can book an Emirates flight here. This is an affiliate link so I do earn a small commission if you choose to make a booking. The link will take you to the US Emirates site, but you can link to other Emirates websites from there – easy, peasy! Author’s note: I paid for my own ticket for this flight using frequent flyer points. I would also like to thank Qantas for their prompt attention in reimbursing my transfer costs when my chauffeur car didn’t arrive in the Gulf. For completeness, my chauffeur did arrive in Sydney. 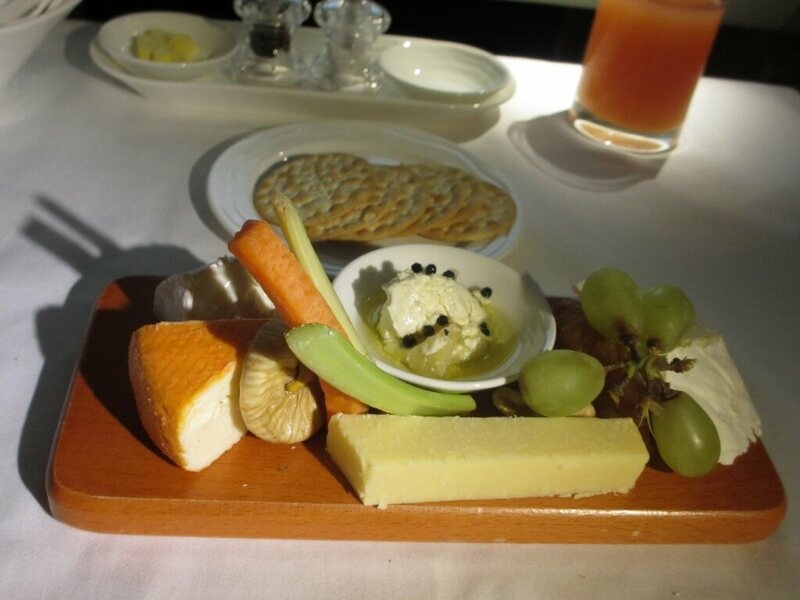 Jo, thanks for sharing your Emirates A380 first class experience. I have not yet tried Emirates so I will keep it in mind for the future, although I would be likely to be travelling in a lower class… The on board shower seems to be very decadent! 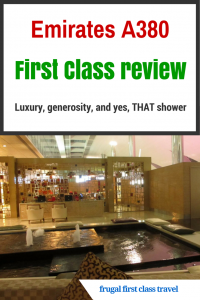 The whole premise of First Class is decadent, so yes, the shower just adds to that! Thank you for posting about this experience. It all seems so lovely. I appreciate your attention to describing the smallest of details; it is so helpful. Your photos tell the visual story well. Sounds like you enjoyed your first class experience with Emirates, Jo. 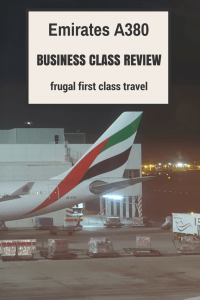 I travelled business class with them to Europe last year and found the service and inflight experience to be wonderful (and our chauffeur turned up!) The Bulgari amenities kits were a real treat and like you, I love the perfume. Here’s to many more business class (and hopefully first class) flights. Certainly did Carolyn. 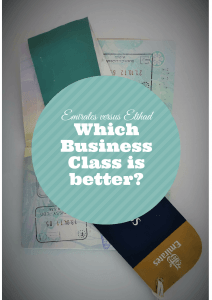 I’ll be doing a comparison of Emirates and Etihad a First Classes in an upcoming post, and I’d be interested in your thoughts. I appreciate how dedicated you were in sampling the champagne! It does seem a bit odd that no one made up your bed – or no one came by to say “whenever you’d like to rest we’d be happy to….”. When I was a student (and therefore getting a massive discount) I would take the cheapest first class seat for the overnight train across eastern Canada to get home from university. Despite the fact that I just had an upper berth, the Via Rail staff came by to make up the tiny bunk like I was in a hotel! Yes, I was somewhat surprised too. I’m always prepared to go that extra mile to bring my readers my best advice – even it does mean drinking more champagne! I’ve never flown first class before, so this was a good read! I’m surprised that they can fit a shower and such spacious seating on a plane but I guess it works! Even your personal space looked like a mini hotel! It really was like a hotel, and the shower was exactly like a hotel bathroom. I’ve stayed in hotels with smaller bathrooms and showers! I’m sure I would love it and would have given the menu a workout regardless. I know I will never experience it and that is just as well because I couldn’t fly economy afterward! yes, that’s the problem – once you’ve turned left there’s no going back! Yeah, it wasn’t great. Fortunately it was all good from there.